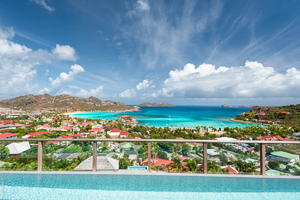 Villa UJV 354, also referred to as Romana, is a modern, private, very well situated, four bedroom villa overlooking St. Jean, St Barts. Located on the St. Jean hillside, Villa UJV 354 is just a few minutes drive to the beach. A large 30-foot infinity pool is surrounded by expansive decking and is the ideal place to catch some rays or relax in the shade under the portico after a day of water sports and beach activities. All four bedrooms offer stunning ocean views, air-conditioning and private bathrooms complete with showers. The bedrooms have three king beds and one queen size beds. The air-conditioned living room has a wall of windows to take advantage of the breathtaking, wide vistas of St. Jean Bay, Eden Rock and the ocean. The well-equipped kitchen overlooks the living room and the view. The long breakfast bar that separates the kitchen from the living room has seating for three guests. To make the most of dinner at home, St. Barth's style, the dining room opens to the pool, deck and bay below giving it an indoor/outdoor feeling. Additional amenities make Villa UJV 354 convenient as well as stylish. Boutique shopping is a short drive away as well as the beachside restaurants all along St. Jean beach. This location cannot be beat.